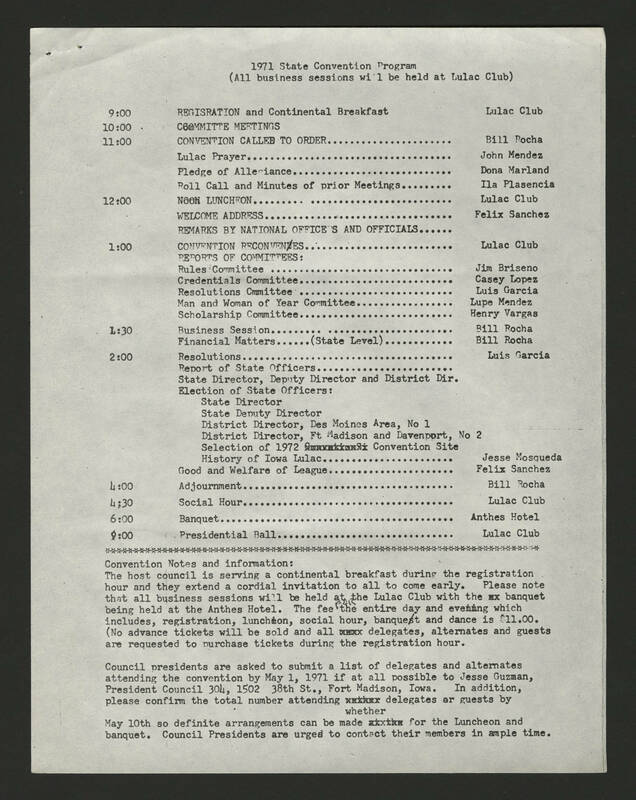 1971 State Convention Program (All business sessions will be held at Lulac Club) 9:00 REGISRATION and Continental Breakfast Lulac Club 10:00 COMMITTE MEETINGS 11:00 CONVENTION CALLED TO ORDER......Bill Rocha Lulac Prayer......John Mendez Pledge of Allegiance......Dona Marland Roll Call and Minutes of prior Meetings......Ila Plasencia 12:00 NOON LUNCHEON.....Lulac Club WELCOME ADDRESS.....Felix Sanchez REMARKS BY NATIONAL OFFICERS AND OFFICIALS 1:00 CONVENTION RECONVENES.....Lulac Club REPORTS OF COMMITTEES: Rules Committee....Jim Briseno Credentials Committee.....Casey Lopez Resolutions Committee.....Luis Garcia Man and Woman of Year Committee.....Lupe Mendez Scholarship Committee......Henry Vargas 1:30 Business Session......Bill Rocha Financial Matters...(State Level)....Bill Rocha 2:00 Resolutions......Luis Garcia Report of State Officers....... State Director, Deputy Director and District Dir. Election of State Officers: State Director State Deputy Director District Director, Des Moines Area, No 1 District Director, Ft Madison and Davenport, no 2 Selection of 1972 Convention Site History of Iowa Lulac......Jesse Mosqueda Good and Welfare of League.....Felix Sanchez 4:00 Adjournment....Bill Rocha 4:30 Social Hour......Lulac Club 6:00 Banquet.....Anthes Hotel 9:00 Presidential Ball......Lulac Club Convention Notes and information: The host council is serving a continental breakfast during the registration hour and they extend a cordial invitation to all to come early. Please note that all business sessions will be held at the Lulac Club with the banquet being held at the Anthes Hotel. The feel FOR the entire day and evening which includes, registration, luncheon, social hour, banquet and dance is $11.00. (NO advance tickets will be sold and all delegates, alternates and guests are requested to purchase tickets during the registration hour. Council presidents are asked to submit a list of delegates and alternates attending the convention by May 1, 1971 if at all possible to Jesse Guzman, President Council 304, 1502 38th St., Fort Madison, Iowa. In addition, please confirm the total number attending whether delegates or guests by May 10th so definite arrangements can be made for the Luncheon and banquet. Council Presidents are urged to contact their members in ample time.